One of the most common aquariums for people to buy is a 10 gallon tank. The small size makes it suitable for lots of households, whether you are on a budget, or looking for a small tank as an introduction to fish keeping. These are commonly marketed as beginner tanks because they are cheap and often come with a selection of other equipment you need to get the aquarium up and running. This guide will walk you through everything you need to know about 10 gallon tanks, from deciding whether to get one, to setting it up, to selecting your fish. Get Your Exclusive Bonus: Download the 10 Gallon Fish Tank Guide which talks you through everything there is to know about this tank size. When considering what is available on the market, 10 gallon tanks are rather small. Tanks of this size will vary in dimensions depending on the shape of the tank, but typically expect around 20” x 10” x 12”. While around 11 pounds when empty, they can reach up to 110 pounds when water is added. This number will increase further depending on the decorations and fish you choose to keep. 10 gallon tanks come in two common varieties, glass or acrylic (more on this later). These tanks are generally marketed at beginners since they often come as part of a kit that includes everything you need to set up a tank, such as filters and lights. They are also offered at a lower price. This allows newcomers to try their hand at fishkeeping without spending lots of money. While this is a perfectly valid reason for purchasing a tank this size, be warned that the low water volumes make it difficult to maintain water quality over time, compared to larger tanks. Consequently, small tanks need to be monitored and cleaned more frequently, so ironically ‘beginner tanks’ are not always best suited for beginners. 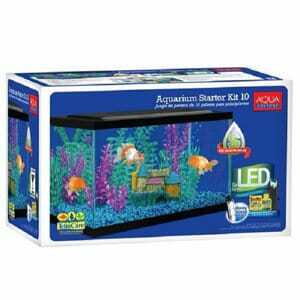 This fish tank is ideal for those who are new to the hobby and want a complete starter kit. This 10 gallon aquarium is perfect for beginners who want to start keeping fish. It is ideal for either a child’s first tank, or a first time hobby tank. If you are looking for a complete kit, this set is great. It includes an internal Tetra filter, a low profile hood and energy-efficient LEDs to mimic the natural sunlight for your fish. This kit also comes with a TetraCare guidance booklet, where you’ll find plenty advice to ensure you are doing everything correctly with your fish tank. Complete set up for a cold water tank. Cut-outs allow easy feeding and filter cartridge changes. Lighting can be quite bright. You will need a heater if you want a tropical set up. Lid isn’t hinged, so you have to remove it to clean the tank. This sleek design is perfect to fit into the modern home and allows you to see the fish from all angles. This kit is a fantastic quality premium set which is made with the highest quality glass to ensure durability and longevity. It comes complete with a cascade internal filter, LED light, mat and a hinged plastic lid. The LED light can be positioned anywhere along the back of the tank to light up the aquarium. This unique aquarium is frameless and seamless, and that combined with the shaped of the glass means that you can view the fish completely unobstructed, including from the top. 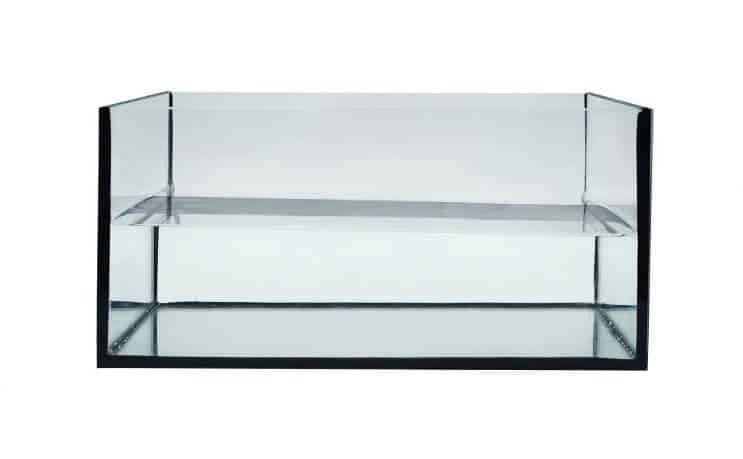 This aquarium measures 12.5 x 11.5 x 17.75 inches and is perfect for a large variety of fish. Beautiful aquarium with simple yet sleek design. Comes with a mat to minimize stress on uneven surfaces. Great quality filter with two customisable chambers. The lamp adds another 4 inches to the height. No on/off switch for the light, you have to turn it off at the plug. You can’t open the lid without moving the light. This is the ideal 10 gallon tank to add your own equipment to, perfect for both beginners and experts alike. This 10 gallon tank is an ideal tank for those who are looking to add their own equipment and design a setup from scratch. Perhaps you are an experienced fish keeper who knows exactly which heater and filter you want to use. This quality tank is made with a high-quality sealant which creates a watertight seal to avoid any leaks. 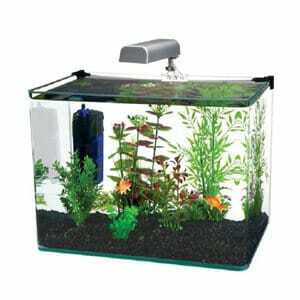 This tank is 20 x 12 x 10 inches which makes it an ideal size and is a quality durable tank. Completely adaptable so you can add your own equipment. Can be used for fish keeping and other things such as keeping reptiles. The seal can be a little messy. It doesn’t get posted with much packaging or protection. You will need to find a hood which fits this tank. 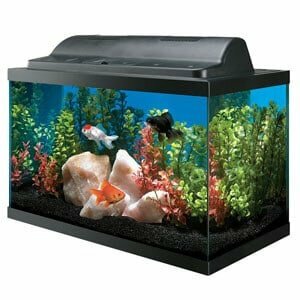 This combo aquarium comes complete with a hood with economical lights and a quality black trim. If you’re looking for a quality tank which is completely customisable in terms of adding all your own equipment and creating the ideal set up for your fish, this tank is best. It comes with both a sturdy glass aquarium and an eco-hood. The hood does not come with lights, but there are fittings to include your own. The tank measures 20 x 10 x 12 inches. Quality tank with neat seals. Reasonable price for the quality of the product. Need to buy your own equipment. Many 10 gallon tanks are sold as sets which will include most of the things you need to start an aquarium; though certain other accessories will also need to be purchased. Some people advise against these sets so that you can purchase higher quality equipment, but it depends on your budget and stocking plans. A filter is arguably the most important addition to a fish tank as it keeps the water clean and healthy. This is even more important in small tanks because it is easier for nitrate concentrations to build up when there is less water. There are a range of different filters. If you only intend to keep a few fish then a plastic, in-tank filter will be sufficient. If you want to fill the tank to its biological capacity, then a small power filter would be more suitable. Each brand will offer a range of these power filters, look out for which one is recommended for the tank size. Though they are more expensive that other equipment (you can expect to pay $20-$30 for a reasonable filter), if there is any component worth investing in, it is the filter. Heaters are less likely to be included in a starter set since they are only required for tropical or marine setups. If these are the setups that you desire, then you will have to purchase a heater separately. There is less of a variety in heater design compared to filters; they all tend to work in the same way, setting a temperature by turning a dial. The only thing to look out for is the size of the heater; the larger the tank, the larger the heater. The recommended tank size for each heater should be indicated on the packaging. We recommend buying a thermometer if one is not provided. Placing a thermometer at the opposite side to your heater allows you to check that the whole tank is being kept at the desired temperature. 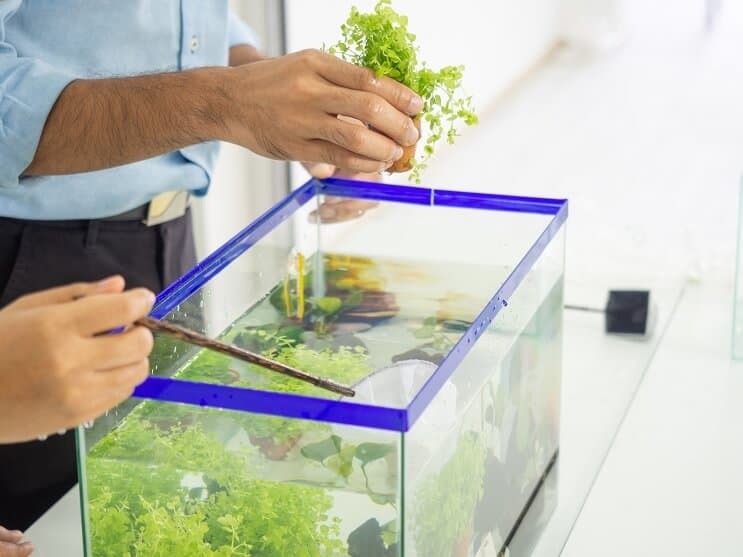 As always when setting up an aquarium, you should already have decided which fish and plants you are going to add to it before you set it up. This is important because different fish and plants will prefer different light intensities. Many tanks will come with a light source in the hood of the aquarium, but you need to check that it is of a suitable intensity for your fish. If it is not, then you may have to buy an additional bulb to swap it out with. One factor that is often overlooked when setting up a new tank is where to place it. While a stand designed specifically for your tank is not a necessity, you need to ensure that the surface you plan to place your tank on can comfortably support its weight. People often decide to add an air pump to the tank to oxygenate the water for the fish. This keeps your tank healthier, but there are other ways to achieve this. Adding plants to your tank will release oxygen into the water as they photosynthesize. An aquarium gravel vacuum is also an important tool. Its purpose is to clear up debris from the substrate when cleaning the tank. Some also remove water so that you can do partial water changes with ease. 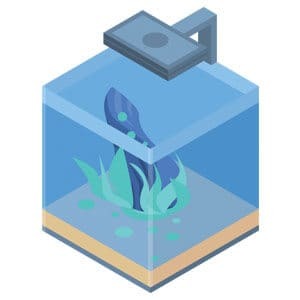 Other, smaller accessories that you might consider include a pad to scrub the walls of the tank, and a net to move fish (and remove dead ones). The last things to consider are substrate and decorations. This should be given a fair amount of thought because you need to consider the preferences of your future fish as well as the limited available space. A 10 gallon tank does not provide an abundance of space, but if the tank is kept healthy then there are a variety of fish that can flourish. 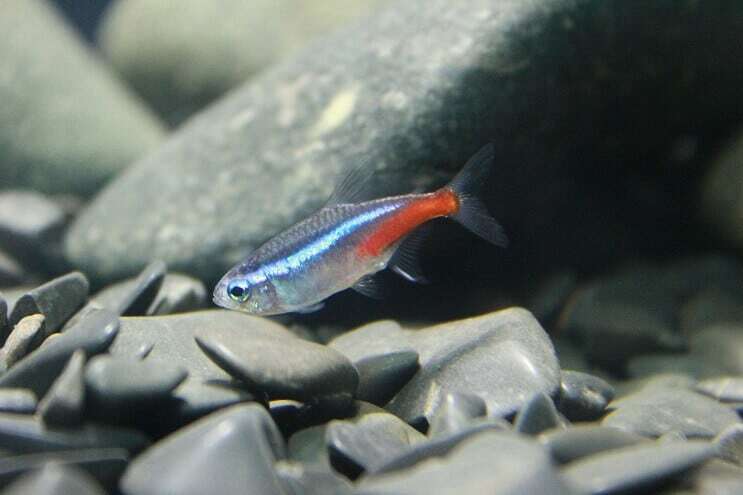 Danios and Barbs: These both make excellent starter fish as they are hardy and more tolerant to changing water conditions. This is a rare trait for fish so small. Tetras: These are some of the most popular fish in the industry. Their vibrant colors and shoaling nature makes them an attractive addition to the tank. 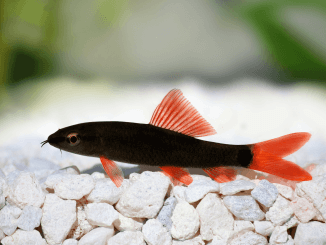 Dwarf Corydoras: These are easy to care for and liven up the lower levels of the tank. 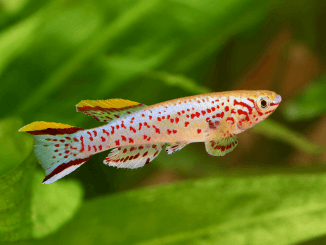 Guppies: Their broad, colorful tail brightens the tank as it moves. Ghost shrimp: A crustacean that helps lighten the load when cleaning the tank. Its transparent body captivates you while watching its insides as it works. Generally, you can keep any peaceful fish within a 1-2 inch size range. Avoid species with a reputation for harassing others. Make sure that you know the adult size of any fish you buy to prevent them growing too big for your tank. Research this yourself as pet store staff do not always give reliable advice. You could consider adding plants to your aquarium. Some (such as hornwort) have been shown to reduce algae levels while also oxygenating the tank. One of the most enjoyable things about starting a new aquarium is designing your new setup. There are many different ways to do this, but it ultimately comes down to your personal preference. Freshwater tanks are often filled with decorations that can be bought from most pet stores. These could be anything from an atmospheric shipwreck to more comical TV show themes. Others opt for a well planted tank to oxygenate the tank via photosynthesis. The plants are often accompanied by rocks or bogwood to give a natural look to the setup. Saltwater tanks tend to be less varied. The most common design is to incorporate corals since they are the natural home to many of the marine fish available. Corals can be quite expensive, so you could buy cheaper decorations that are designed to look like corals. You could then add live corals once you have more experience. If you’re using the tank as a breeder tank, you need to look into the specific requirements for the species of fish you want to breed. Some require a bare bottom and no decorations, others require fine substrate and some plants to protect the fry. When looking for a 10 gallon tank you will find that some shops stock glass versions while others offer acrylic. Glass aquariums are usually better quality. Glass is much more durable than acrylic; it’s much harder to scratch. When cleaning the sides of acrylic tanks, you need to be careful that your products are acrylic-safe to avoid scratches. You also need to ensure that no substrate gets between the scrubber and the acrylic. Glass will also retain its clarity over longer time periods whereas acrylic can develop a yellow tinge, particularly when exposed to direct sunlight. If you plan to use the tank for a long time, then glass will be better value for money. Acrylic isn’t all bad though; it weighs less than its glass alternative. If you are worried about the strength of your aquarium stand then an acrylic tank is a safer option. Due to the popularity of glass fish tanks they are cheaper than acrylic, even though acrylic is a cheaper material to produce and transport. A glass tank will cost roughly $20-$40, varying between retailers and the type of set being offered. Since 10 gallons is relatively small, the difference between glass and acrylic prices will be minimal, at about a $5-$10 difference. The first thing to add to your aquarium is the gravel, but it needs to be thoroughly cleaned first. Place it in a bucket and run water through it while agitating it with your hand. Once the water runs clear, most of the dust from storage and transport will have been removed. Gently add a thin, smooth layer of the gravel to the tank (0.5-1 inch) to avoid scratching the bottom. Next up is decorations. Again you need to rinse your decorations first. Now add them to your tank and add the water. Make sure to add the decorations first so that you are not surprised by the height of the water’s surface once the decorations displace the water. Treat the water with a dechlorinator/water conditioner. This will remove the harmful chlorine in the water for your fish. 1ml per 10-gallons should suffice but check the recommended dose on the bottle. If you are setting up a marine tank you will need to prepare artificial saltwater. This can be done with purified water and sea salt bought from a pet store. Let the water rest for a day as it may take a while for the salt to dissolve. Once you’ve added you water, the last step is to add your filter and heater (optional). Rinse the internal material of the filter before adding it to your setup, some assembly may be required so follow the instructions provided with your filter. Though the tank is physically set up, it is not yet ready for fish. The tank still needs to be cycled. Fish waste releases ammonia into the water. This is harmful to fish if you don’t have enough bacteria in the tank to break it down. Therefore you need to cycle your tank before you add fish. Cycling is based upon the nitrogen cycle. This is done through two processes, one is converting ammonia to nitrite, the other is converting nitrite to nitrate. Of these three compounds (ammonia, nitrite, and nitrate), nitrate is the only one that isn’t toxic to fish if kept at low quantities. The two processes are carried out by bacteria. Therefore, you need time to produce the bacteria before adding the fish. Luckily most of the process is automated and all you will need is a water testing kit and some ammonia supplements. At the start of cycling, add 2-4ppm (parts per million) of ammonia; from then on add 1ppm every few days. The bacteria will feed on this ammonia and multiply. The cycling can take anywhere from 2-8 weeks. Every week check the ammonia, nitrite, and nitrate levels. If you do not have a kit to test the water, most pet stores will do it for you if you bring them a sample. At around two weeks, the nitrite levels should spike. After this, bacteria will start converting the nitrite to nitrate. Once ammonia and nitrite levels reach 0ppm the cycle has ended, and you will be able to slowly add fish to your aquarium. The process that has been described is an example of fishless cycling. Cycling with fish is often considered unethical since the ammonia spikes are harmful to the fish. You’re now ready to add fish to your tank; it is important that you only add a few at a time so that they do not produce too much waste for the bacteria to handle. Before you add them you need to ensure that the water is at the temperature you desire (if heated). Place a thermometer as far from the heater as possible and leave it for a while. When you return the thermometer should show the temperature you set on the heater. Once you have bought your fish, turn off the aquarium light and float the plastic bag containing the fish on the surface of the water for 15 minutes. This will acclimate the fish to the temperature of your tank. Open the top of the bag and add half a cup of your tank’s water to it every 15 minutes for 1 hour. Now they are acclimated to your water parameters, use a net to lift the fish out of the bag and release them into your tank. Remove the bag without introducing any of its water to your tank as it might contain pollutants or diseases. Leave the tank’s light off for a few hours to allow the fish to get used to their new surroundings. 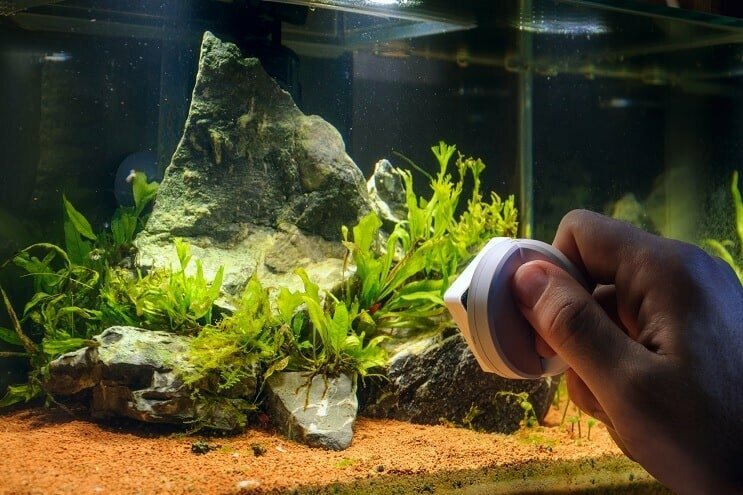 Removing algae from the aquarium using an algae magnet. Surprisingly it is harder to maintain smaller tanks than larger thanks; this is because it is much easier for pollutants to build up in the water. For this reason, water changes should be done weekly. 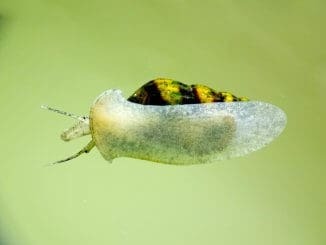 Though water changes must be done frequently, the small tank size means that they should only take a few minutes to do. Using a small aquarium vacuum and start siphoning out some of the water into a bucket. Once you have emptied 30% (3 gallons) of the tank you can stop the water flow and empty the bucket. Fill your bucket with 3 gallons of tap water, making sure to treat it with water conditioner, and slowly pour it into the tank. The water you add needs to be a similar temperature to the water in your tank. As fish are cold blooded a change in water temperature can cause stress and disease. Any equipment you use for the water change (e.g. the bucket) need to be reserved for fish keeping. This prevents chemicals or pollutants being added to the aquarium with the new water. In addition to the water cycling, you need to scrape off any algae that settles on the walls of your tank. The walls will have to be cleaned in this way every few days, whenever you see algae settling. If not done regularly the algae can quickly build up. Cloudy water can mean a number of things. If it occurs in a newly set up tank, then it is likely that a mini-cycle has been triggered. This could be due to an excessively large water change or adding too many fish too quickly. In this case the cloudy water is formed by a rapid bacterial bloom that should pass on its own anywhere from 1 day to 2 weeks. The cloudy water could simply be due to the introduction of dust to the aquarium, normally caused by added decorations or substrate that have not been thoroughly rinsed. This problem will clear up on its own over time. If the water is slightly green, then algae may be blooming in the water. To counter this try increasing the frequency of water changes until the problem subsides. Also make sure you keep the tank out of direct sunlight. So, is a 10 gallon tank right for you? If you are on a budget, you will not find a better deal than a tank of this size, especially since many come with a set containing most of the things you need. If you are a beginner who is picking this size because it seems easier, then you may want to consider looking for a larger tank. Bigger tanks are more stable and can survive beginner mistakes more easily. That being said, if you have the dedication to regularly maintain the tank then it is suitable for anyone, beginner or expert. I am re-entering the hobby, and started with a 10 gal “starter” kit. Its been cycling for 4 weeks now. My wife is new to the hobby, and I got over anxious and put 3 guppies and a mystery snail in before I should have, and we lost one of the guppies. I have many years of experience, just not real recent, and I knew better, but wanted to impress her. Things are doing better now, the fish seem healthy and happy, and I’m looking forward to stocking my new tank. We tried 3 neon tetras and a pleco with our male betta and the betta killed all of the other fish. Goodluck! Hopefully the betta you pick doesn’t eat his friends. I’m currently in the process of cycling my 10g tank and am pondering which fish to put in it. I’ve ready so many different thing about how many fish you can put into a 10g tank. Snt recommendations would be awesome. Were i live we only have a petland so kind of limited to what I have available to me.